Will Any Plants Thrive in Dry Shade? Looking out the window on a rainy day I forget that spot way back in the shade in the back of the garden will be bone dry come summer. It’s too far away to water conveniently very often with a hose and extending the irrigation for just that one area under the trees in the shade is not practical. I sympathize with clients when they ask me what will grow in a problem area like this. Believe me I know it’s a challenge to bring in some colorful foliage, texture or might I be so bold as to want flowers, too? Take a tip from one who lives in a similar area with the same problems. We’re in this together. At this time of year when the plums are blooming and the flowering pears are clothed in white blossoms, I want something to extend this look out in the garden. There are several plants that bloom early in dry shade and fortunately they are also deer resistant. Later in the season when soil moisture all but disappears there are other plants that will take over center stage. 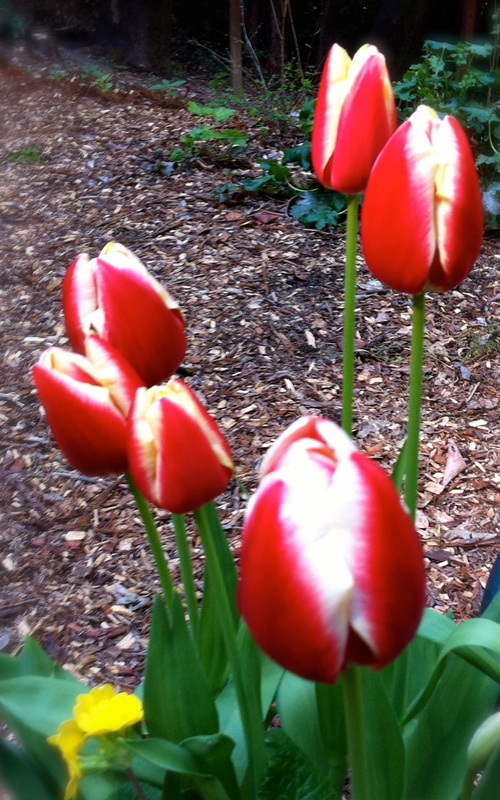 But first here are the candidates for early spring color and fragrance in shady gardens. 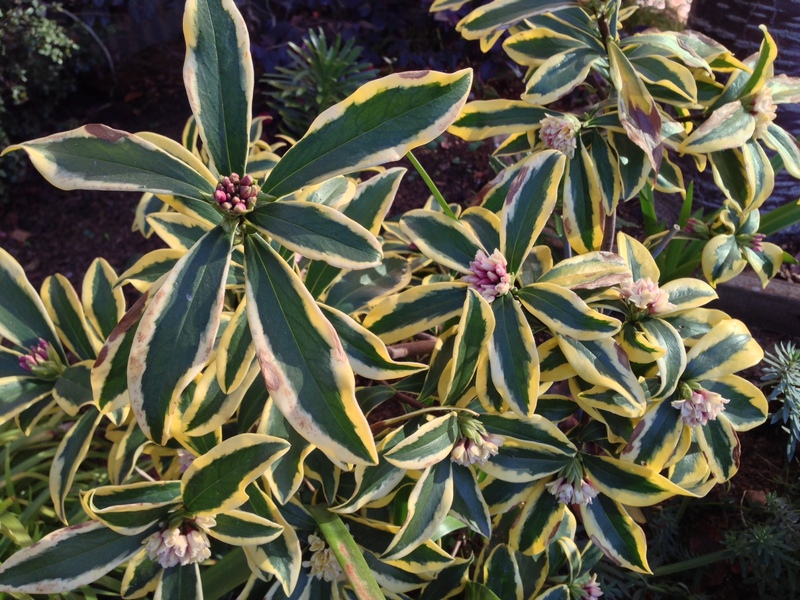 Fragrant Winter daphne is a handsome evergreen shrub and I especially like the variegated foliage of the variety ‘Aureomarginata’. 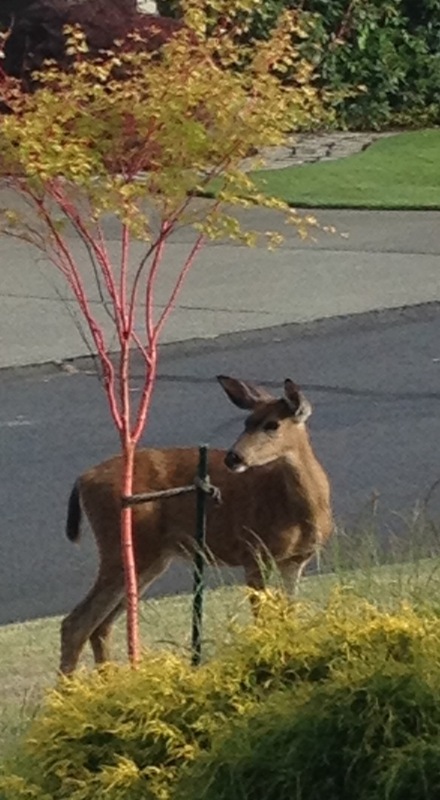 This small, deer tolerant shrub is good looking year round and does well under the shade of small trees. 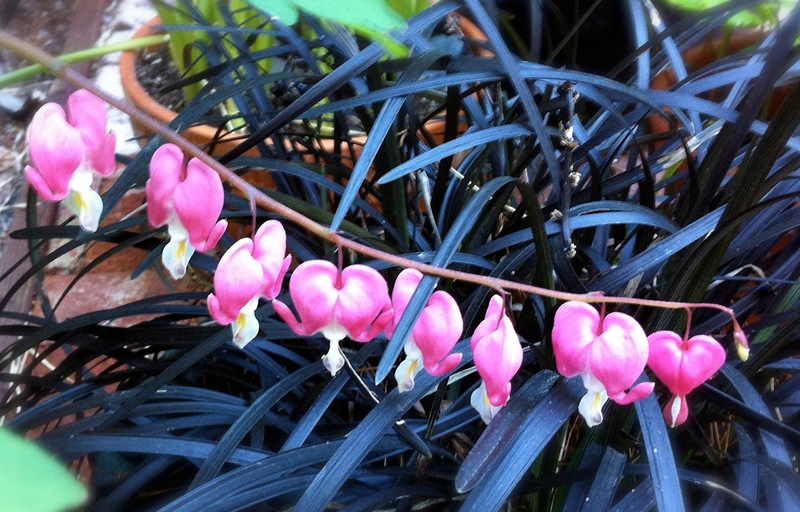 Although many daphnes are tricky to grow, this one is adaptable and easy to please. During the summer water it as infrequently as the plant will allow. This is usually about once per month. Little or no water in summer will reward you with clusters of fragrant purple flowers that start opening at this time of year. 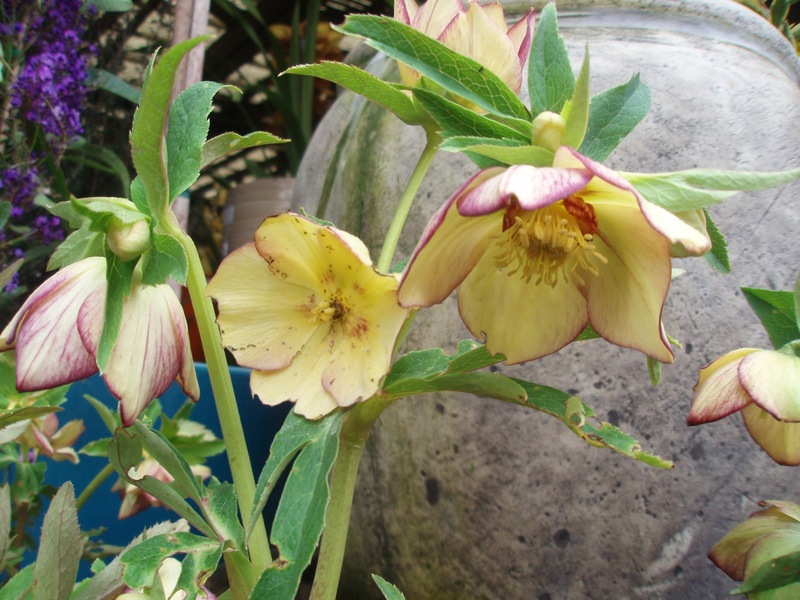 Cut them to bring inside with hellebore for a pretty bouquet. 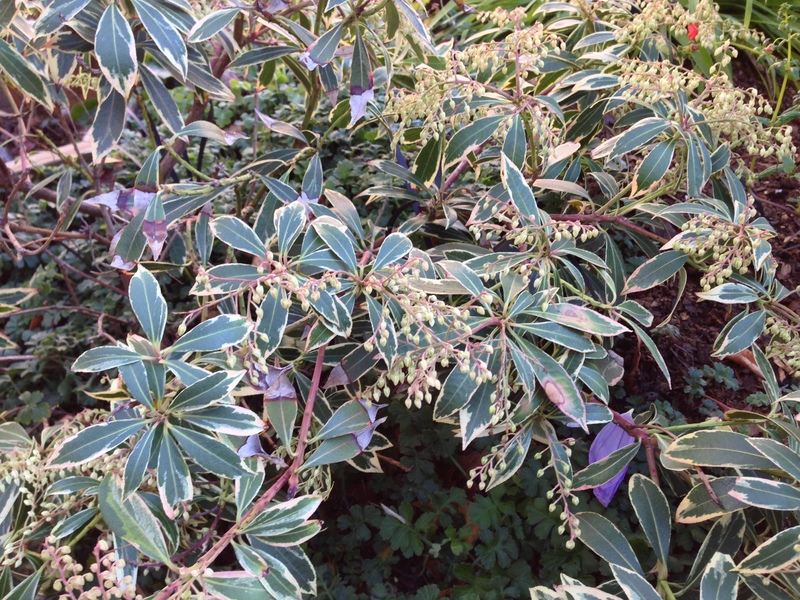 For fragrant May flowers try daphne burkwoodii ‘Carol Mackie’ which is also easy to grow and requires only occasional water as does daphne transatlantic ‘Summer ‘Ice’. Summer Ice produces sweetly scented flowers for an extraordinarily long time. Flowering begins in early April and can continue as late as November. 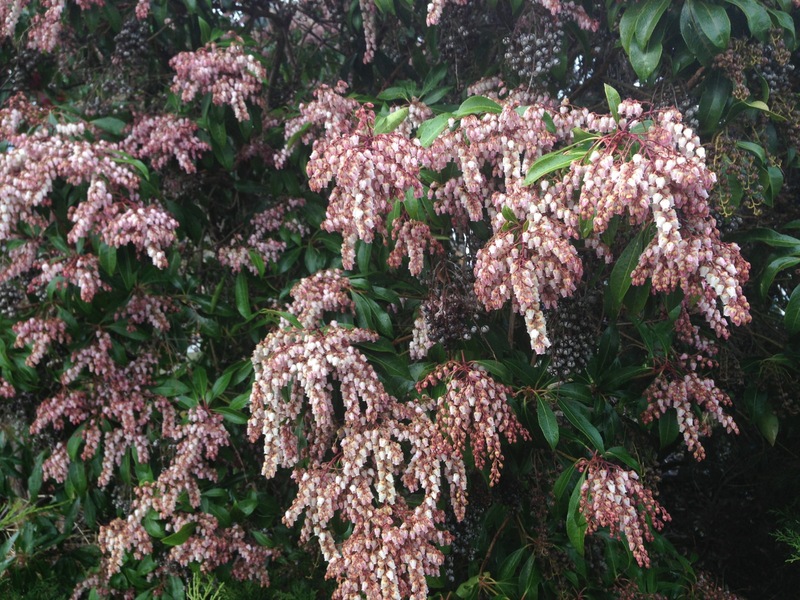 Another powerfully fragrant plant for dry shade is commonly known as sweetbox. Sarcococca may not be showy enough to give to your Valentine but the sweetly scented flowers attract hummingbirds and fill the winter garden with a delicious fragrance for weeks starting in January. Sarcococca ruscifolia forms an upright bushy shrub about 4 feet tall. Another variety called sarcococca hookeriana humilus makes a great ground cover as it rarely exceeds 1 1/2 feet tall. 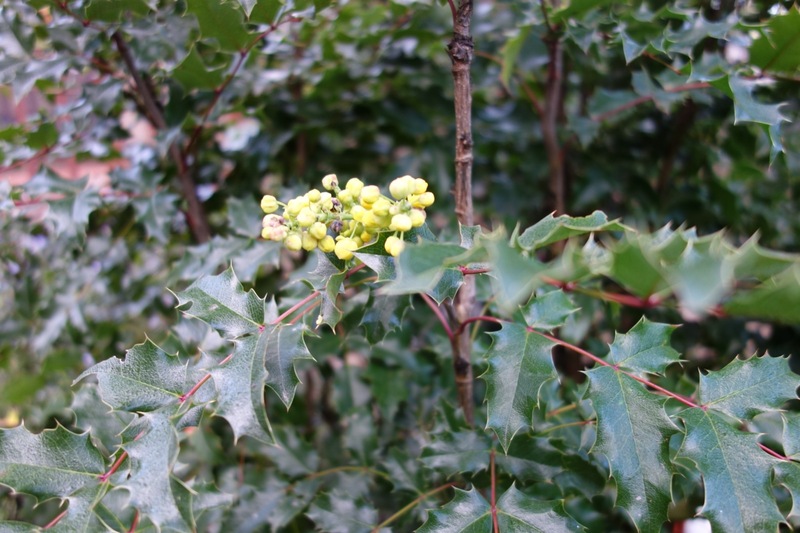 Both plants have dark green leaves, attractive berries and are deer resistant. 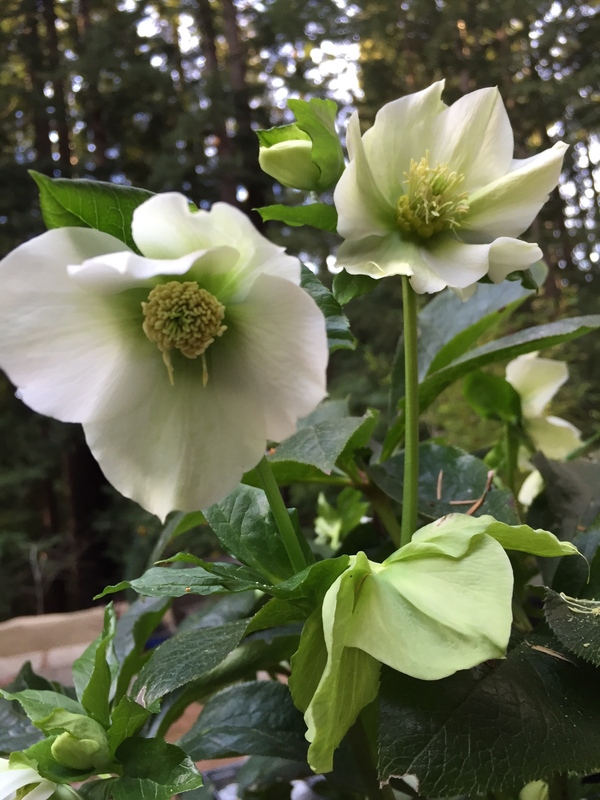 Hellebores are another winter blooming plant with foliage that looks great, too. 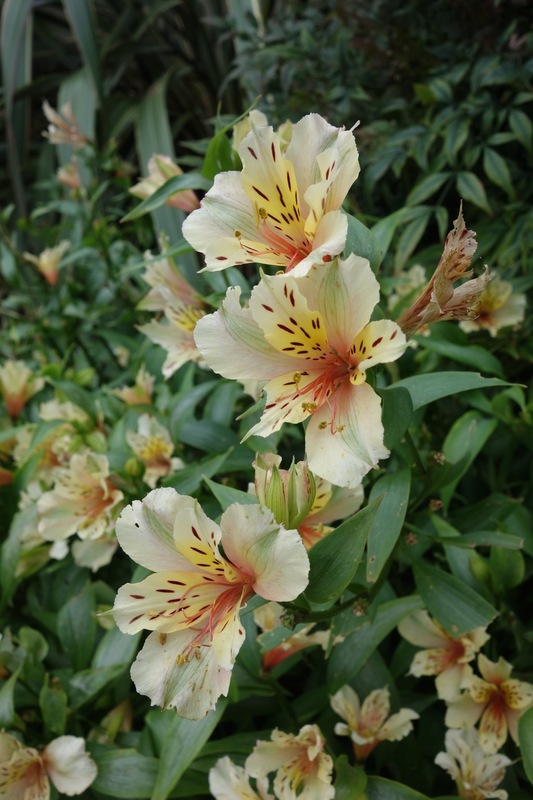 I have several varieties including orientalis, argutifolius and foetidus. My Golden Sunrise has large, canary yellow flowers. It’s been blooming for almost a month and will continue for several more weeks. Hellebores are often still flowering during the Christian season of Lent from which they get their common name, Lenten Rose. They are good plants for naturalizing under trees as they are low maintenance, survive with little water and are disease free. Other plants that bloom at this time of year and require only moderate summer irrigation include Lily-of-the-Valley shrub, clivia, bergenia, mahonia and Pacific Coast iris. As summer approaches other plants and shrubs will lend their color and texture to the dry shade garden. Western Wild ginger and Pacific Coast Iris are great ground covers. 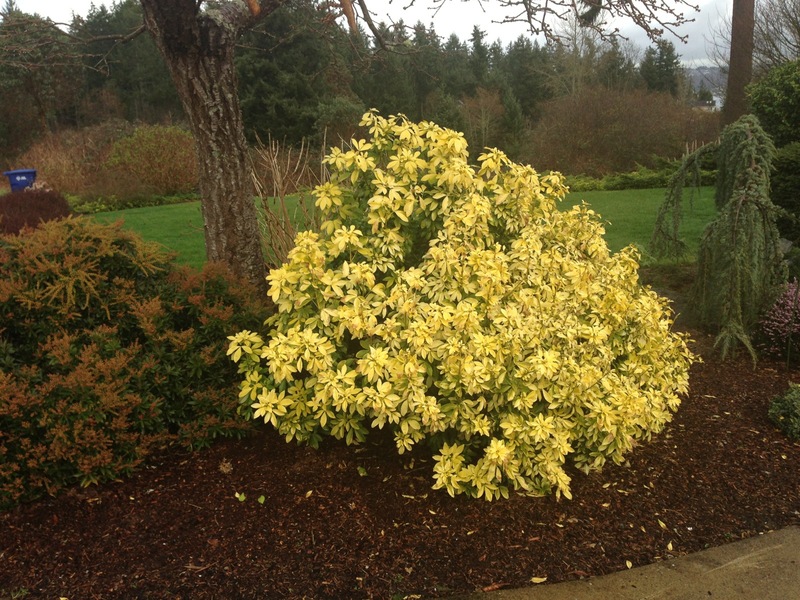 Good shrubs include deer resistant Osmanthus fragrans or sweet olive. Their white flowers are tiny but powerfully fragrant. 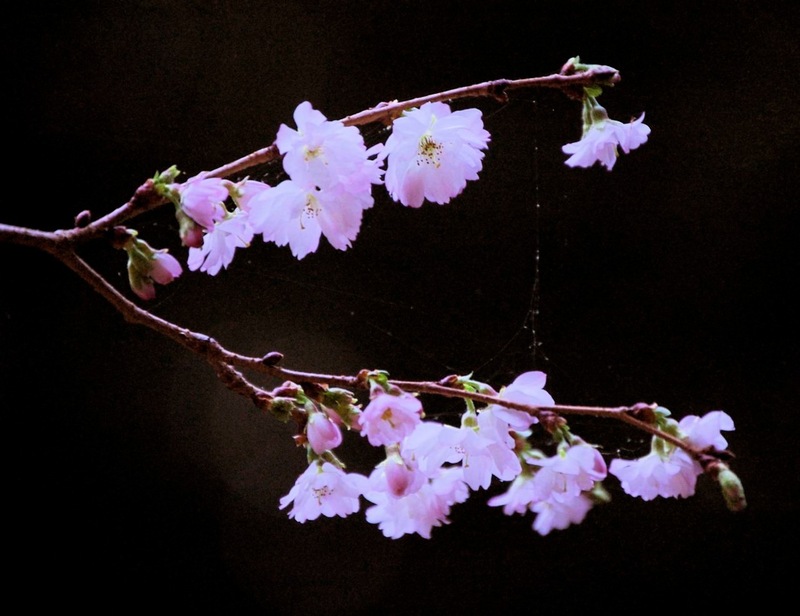 Bloom is heaviest in spring and early summer but plants flower sporadically throughout the year. 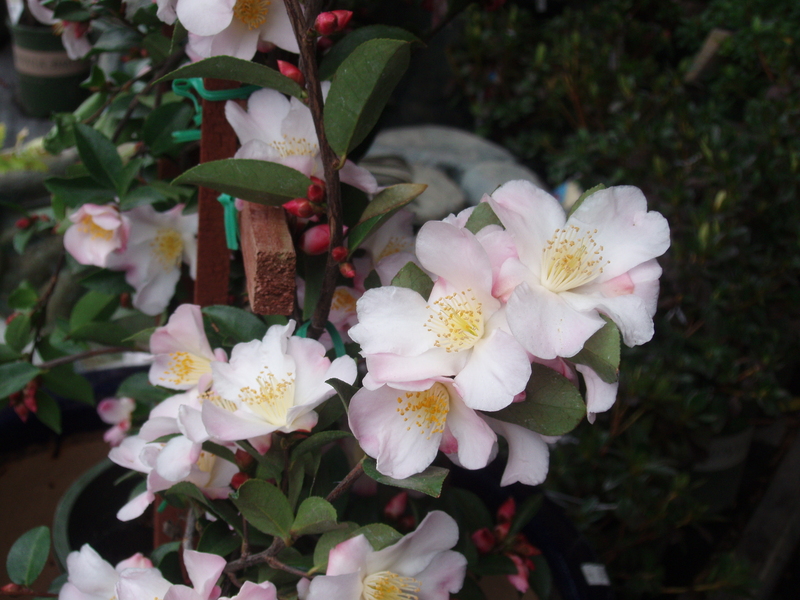 This compact shrub grows at a moderate rate in full sun to partial shade and reaches 10 feet. Heavenly bamboo are work horses in the shady garden. 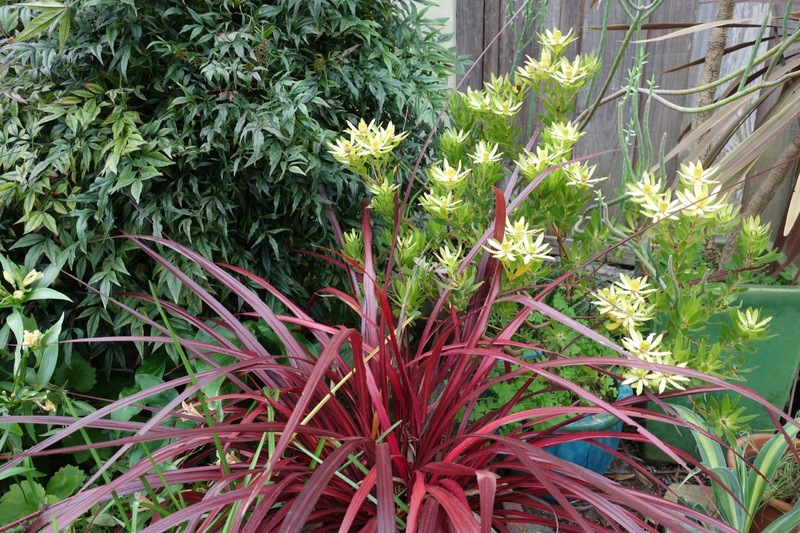 For a different look try growing nandina filamentosa or Thread-leaf nandina. 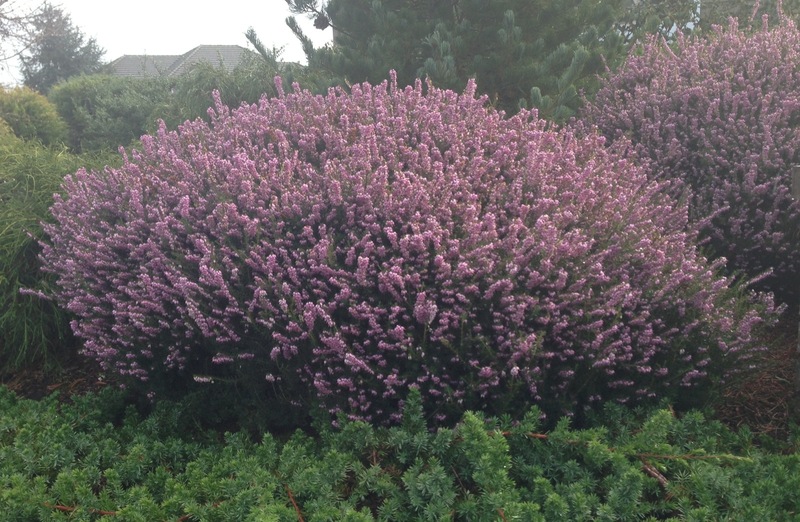 This evergreen small shrub grows to 2-3 ft tall with very lacy, almost fern-like growth. New foliage is reddish in color and during the fall the leaves turn orange or purplish red. 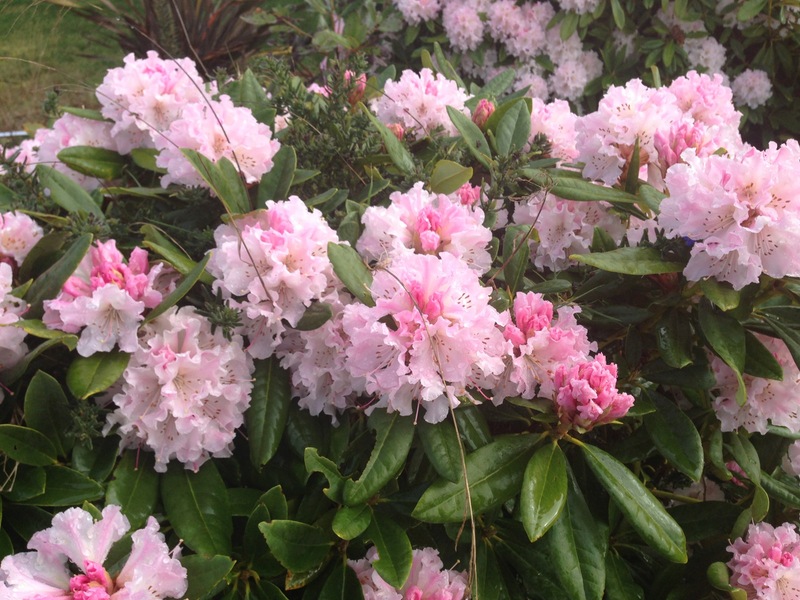 Pinkish-white flowers bloom in clusters in late spring and summer. There are lots of other shrubs and plants that require only occasion summer water for those shady spots. Email me and I can share even more ideas and suggestions. It’s as fun for me to give a little something during the holidays to those I care about as it is to receive a present. I admit I look forward to what might be under the tree but half the fun of the holidays is putting together an inexpensive gift that is just right for each person on my list. With so many gardeners on that list, the choices are endless. Here are some ideas that you might find just right for those you love. I’m particularly drawn to the many frilly and ruffled echeveria that are available now. 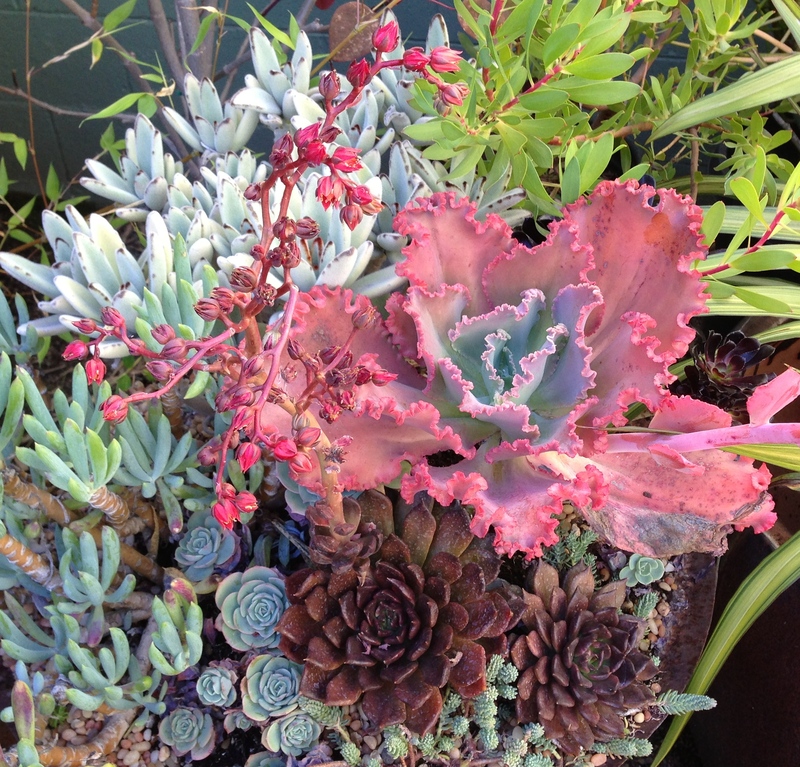 There are 180 different species of this succulent and hundreds of hybrids to choose from. Many of them are blooming at this time of year making them a showy gift that’s sure to get you a lot of thanks. With names like Afterglow, Easter Bonnet, Red Edge, Coral Glow, Perle Von Nurnberg, Morning Light, Blue Surprise or Fire and Ice you can pretty much pick the shade of scarlet, tangerine, purple, opalescent blue or nearly black, often with a combination of colors. 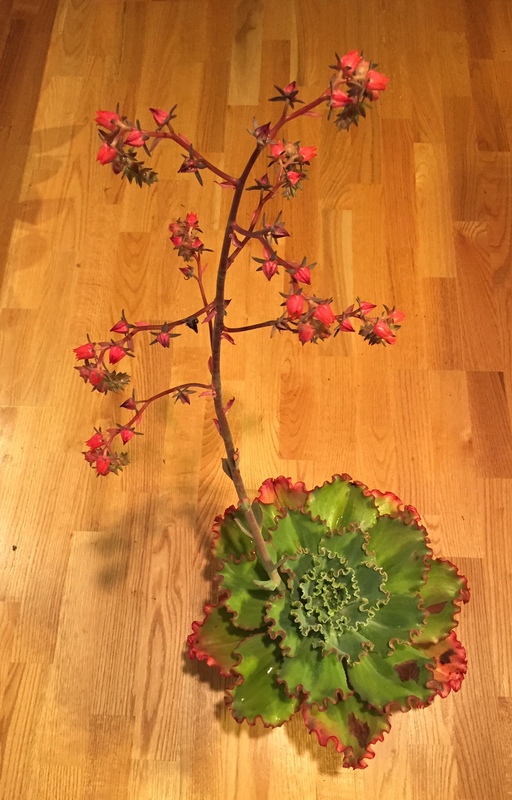 These rosette shaped succulents are native to Mexico. The brilliant colors of the leaves never fade and the waxy flowers last a very long time. They make ideal potted plants and are easy to propagate. The perfect gift in my book. 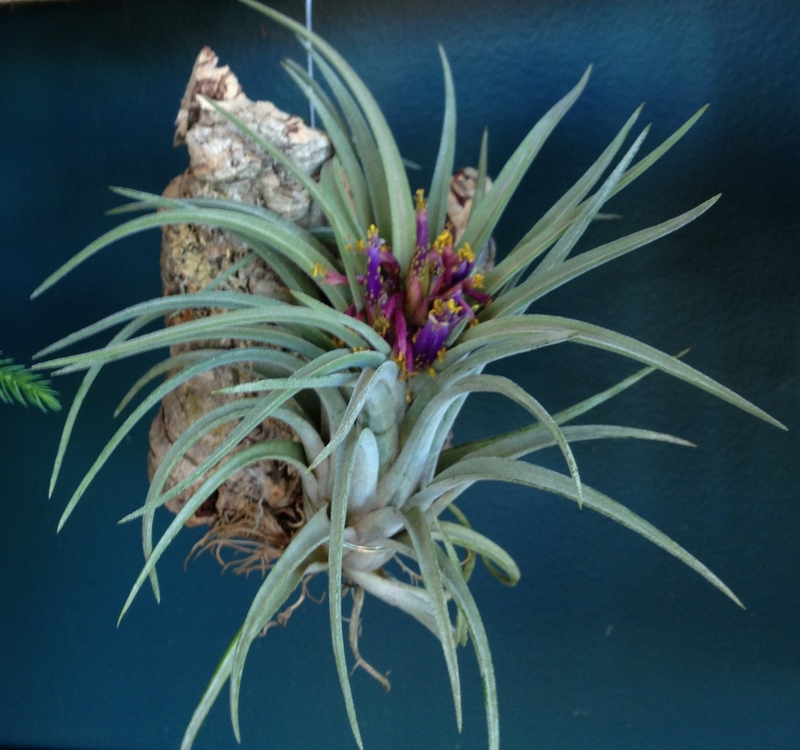 Another simple, inexpensive gift for the gardener on your list is the tillandsia. Sometimes called air plants, these relatives of Spanish moss and pineapple have tiny scales on their leaves called trichomes which serve as very efficient absorption systems to gather water. They are very tolerant of drought conditions and will grow with just an occasional spritzing of water although I like to run mine under lukewarm water to mimic the showers they might get where they normally grow in tropical tree limbs. Tillandsia prefer the light fr om a bright window but not direct sunlight and are among the easiest of indoor plants to grow and maintain. Wire one on a branch or piece of driftwood or place in a shell where they will live happily for years growing pups at the base that replace the mother plant. 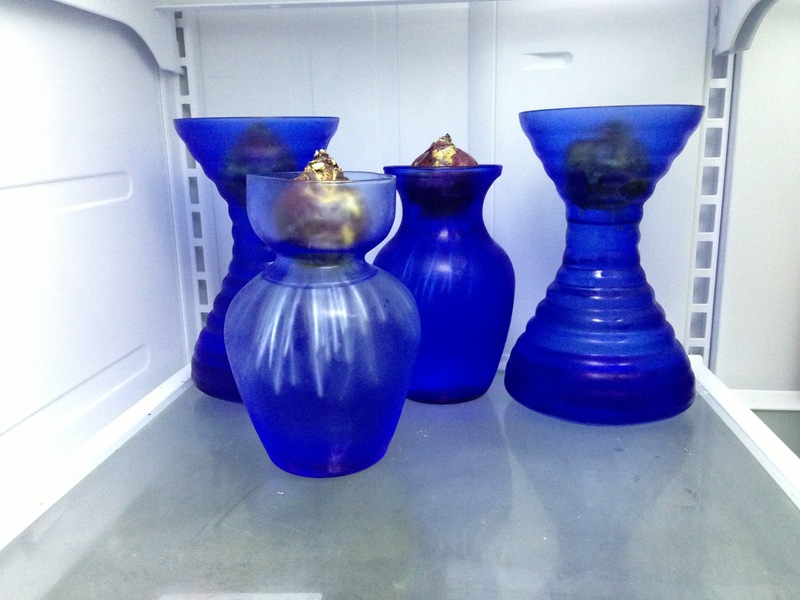 It’s not too late to start a couple of hyacinth bulbs in the refrigerator to give as gifts. Part of the fun is watching the bulbs put out roots well before the fragrant blooms. Choose a hyacinth jar or other narrow necked jar that will support the bulb just above the water and keep in the frig until roots start to fill the jar. Take the bulb out of the dark and give it a bit more light each day for a week until acclimated to bright light. The house will fill with the sweet scent of spring even though it may only be January. They say that we often give a gift that we ourselves would like to receive. Simple is sometimes the best but they all say “love”.